Horses continue to play a big role in a man’s life. For hundreds of years, they have accompanied humankind in performing everyday duties, taking us from one place to another like the strong and reliable servants they are. That is why it is only fair that we take care of them by giving them the best horse blanket money can buy. In this article, we will present comprehensive reviews of three of the best blankets that your horse will surely enjoy. Each one was carefully selected based on the many features that they offer. Read through the reviews below to find the perfect match for your beloved horse. Choosing the best blanket for your horse requires a lot of thought and research. There is a long list of factors that you would consider to find the perfect one that would meet all of your needs. There is a vast selection of horse blankets on the market today. There are blankets especially designed to cool horses down, while there are those made to warm them up. Additionally, there are also rain sheets to use during the rainy season, fly sheets to keep insects off of your precious horse, and stable blankets for when they are kept in a stall. Once you know what you need, you would also need to decide what size, which color, and style to pick. To give you a headstart on your search, we have reviewed three of the best horse blankets on the market today. The first on our list is the Tough-1 1200D Snuggit Turnout. This horse blanket is only one of the many quality products that JT International offers to the equine industry. Over the past 40 years, they have been selling horse equipment to more than 50 countries all over the world. Their products are designed to provide the most comfort and safety for both rider and horse. Another quality horse blanket available on the market today is the Free Runner Turnout Blanket from Intrepid International. This family-owned business is dedicated to designing and manufacturing products for both the horse and his rider. They have been among the leading brands in this industry since 1996. If you are trying to find a winter turnout blanket for your miniature horse or pony, then you might want to look into the Derby Originals 600D Blanket. This brand is passionate about designing and selling quality products that are designed to make your little ones feel cozy and warm during the rainy and winter seasons. Depending on your personal needs and preferences, any one of the horse blankets presented above could be the one you are looking for. If you are trying to find a heavy-duty horse blanket, then the best choice would be the Tough-1 Snuggit Turnout Blanket. 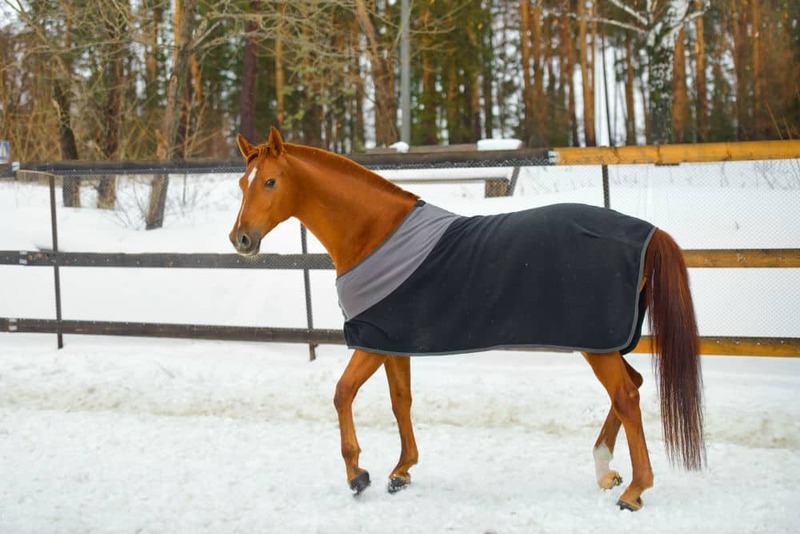 With this product from JT International, you can be sure that your horse is getting the warmth it needs while also confident that the blanket will last for a long period. It is made from a 1200 Denier Polyester material, which means that it is the most durable among the all three. Additionally, the 300-gram Polyfill means that it delivers heavy warmth. Another great feature that this horse blanket by JT International offers is the fact that it comes in 10 beautiful colors including royal blue, burgundy, red, turquoise, tan, navy blue, sea glass, purple, gray, and hunter green. This blanket also comes in an extensive range of sizes from 54 to 84 inches. It has an adjustable neck to guarantee a secure fit. On the other hand, the one from Derby Originals is perfect for those looking for a blanket for their pony, donkey, or miniature horse. They offer this blanket in many sizes ranging from 36 to 58 inches. This horse blanket falls under the category of medium warmth and medium strength, which is enough to make your pony feel cozy during cold days. Similar to the other two horse blankets mentioned above, this one from Derby Originals also has a waterproof outer shell to keep your pony dry and safe from the rain and harsh wind. This product only comes in two colors to choose from which are purple and red. ← Best Horse Riding Gloves: What is the Best Value for Your Money?